When Twitter launched in 2006, it became hugely popular very quickly. By 2012, each day’s feed included 340 million tweets from more than 100 million users. Today, the user base is more than 500-million strong and growing fast thanks to the likes of celebrities, brands and news networks choosing to disseminate information on this platform. With so many users tweeting, retweeting and following links each day, sound analytics play a vital role in allowing marketing professionals to gauge campaign outcomes and project next moves. Twitter’s own analytics tool, which the service recently rolled out to all users, provides some useful data to social media analysts but third-party analytics tools like Unmetric are providing even deeper information that effective marketers use to engage customers. In 2011, Twitter announced that it would roll out its analytics package to a small group of business partners and that the service would be available to all owners of websites shortly. It took a while, but in 2014, Twitter rolled out Twitter Card Analytics, providing metrics on total tweets and retweets, along with clicks and impressions related to linked websites. Twitter Analytics now provides all account holders with suite of analytics tools with the following top-level navigation: Home, Tweets, Followers, Twitter Cards and Tools. The Home tab provides highlights and an overview with information like the total number of tweets, impressions, profile visits, mentions and total followers over the past several months. The Tweets page provides impressions by day within the current period and allows users to view a graph of impressions per day. The page also displays individual tweets with their related impressions. Information on engagement includes the overall engagement rate, link clicks, retweets, favorites and average favorites per day. The Followers page breaks down total followers by demographic information, including gender, location and interests. It includes a graph showing the trend in gained or lost followers over several months. The Twitter Cards page breaks down information related to the cards, which let users add “rich media experiences” to tweets. Information provided includes retweets and URL clicks. Twitter itself provides valuable data that marketers can use in crafting and measuring campaigns. But third-party companies are taking it one step further by providing in-depth Twitter analytics. Companies like Unmetric delve more deeply into the wealth of information available from Twitter accounts. In addition to the basic historical account information that Twitter provides, Unmetric analyzes content from thousands of companies to provide marketers with full benchmarking capability. The ability to compare results to competitors allows Unmetric users to understand not just whether their campaigns and their competitors’ campaigns are working, but why they’re working. Deep data and advanced tools allow users to dig into the strategies of major companies like Coca-Cola and use that information to the advantage of their own campaigns. Users can take advantage of the Best Performers tool to learn how other brands create their content, sorted by date and sector. A feature known as Highlights alerts users when algorithmic data indicates a new marketing trend they should take a look at. Alerts also keep users informed of any unusual activity with their brand or their competitors’ brands. Unmetric uses advanced algorithms to allow marketers a deeper approach to their content marketing through a system known as Intelligent Workflow. And advanced tools even let users know when their competitors are providing better customer service. Effective use of Twitter in marketing is about much more than posting content and forgetting it. It’s about interacting with and engaging customers and prospective customers, creating excitement and encouraging social sharing and brand evangelism. Especially for medium and large-sized companies, keeping track of Twitter interactions and content results would be impossible without the use of advanced analytics. For any marketing tool, including social media, companies need to be able to track their return on investment. With Twitter, ROI means retweets and user engagement leading to clicks, time spent on a site and, ultimately, sales. Advanced analytics allow marketers to document and hone that process every step of the way, beginning with campaign creation and posting. At no time in the history of modern marketing has such detailed and helpful information been available. Advanced analytics provide information to any depth a marketer desires, and savvy marketers adjust their own strategies based on what they find. The ability to monitor exactly what competitors are doing on social media platforms like Twitter — including the content they post and the reaction it draws — is invaluable to marketers. Likewise, looking to other industries can also provide valuable inspiration. Analytics across industries reveal trends in the types of content engaging users, what’s drawing clicks, and what’s drawing retweets and other forms of online brand engagement. Although all types of businesses are taking advantage of advanced Twitter analytics, sectors heavily focused on customer service — including airlines, telecom and service-based industries — find the data to be of particular value. Unmetric provides users access to the social media performance of over 30,000 of the biggest brands across 30 sectors. Unmetric provides metrics such as Average Reply Time, Follower Growth Rate, Engagement Rate, Social Media Campaign tracking and performance and lots more. Forbes notes that social media, including Twitter, is providing a new means for companies to interact and communicate with both customers and prospective customers. The magazine has advised customers of airlines, specifically, to use Twitter as an effective means for complaining. PR experts encourage companies to communicate frequently as a way to avert public relations disasters. In the case of a customer-service or technology-related breakdown, such as a hacked website or security breach affecting customers, getting in front of the issue on Twitter can work wonders. Hashtags often are used as a common element to tie together campaigns, but they also can quickly create a cohesive customer support effort. Another way businesses are using Twitter for customer support is through tracking the “@ mention” function. When customers refer to a specific company or brand, they typically tag their posts with the @name. By tracking @ mentions, customer service teams can ensure that they personally address any complaints, questions and even praise. Zappos is a company widely recognized for its exceptional use of Twitter in customer service. The company, known for its stellar customer service overall, uses Twitter as a way of providing a personalized experience for its customers. Staffers sign in and out for their “shifts” on Twitter, making users feel that someone is right there and available at any time to assist. JetBlue also provides exemplary customer service via Twitter, extending its reputation as the industry leader in keeping customers happy. Twitter devotees love the service for its fast pace and quick access to timely information, and they expect the same quick access to excellent customer service. Companies can maximize their use of Twitter by providing a personalized, timely customer service experience and by using in-depth analytics to track user engagement. 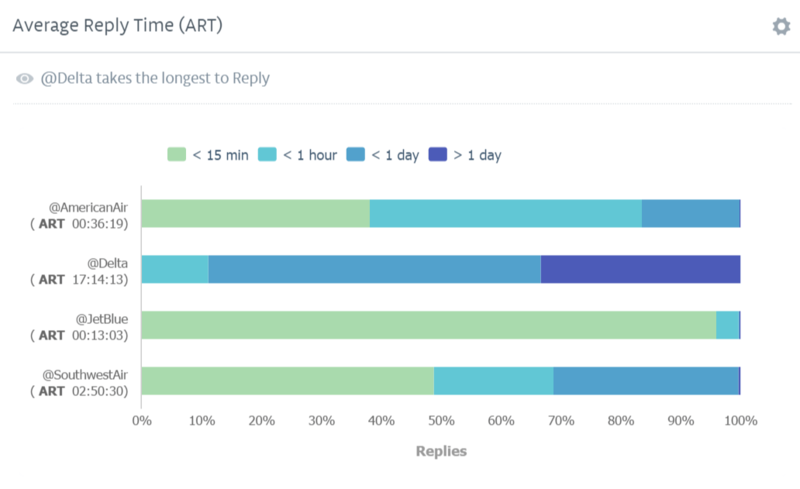 The average reply time (ART) is a metric that the biggest airlines in the world keep an eye on.Travellers tweet to their respective twitter handles to get the latest information on anything and expect replies within in minutes. Below is a comparison chart of 4 airlines and their respective ARTs. As you can see @JetBlue has the fastest ART. Unmetric offers the above shown metric and much more.